At a verdant corner of intersecting labyrinthine lanes in D’Mello Vaddo sits a Red and Ochre house. 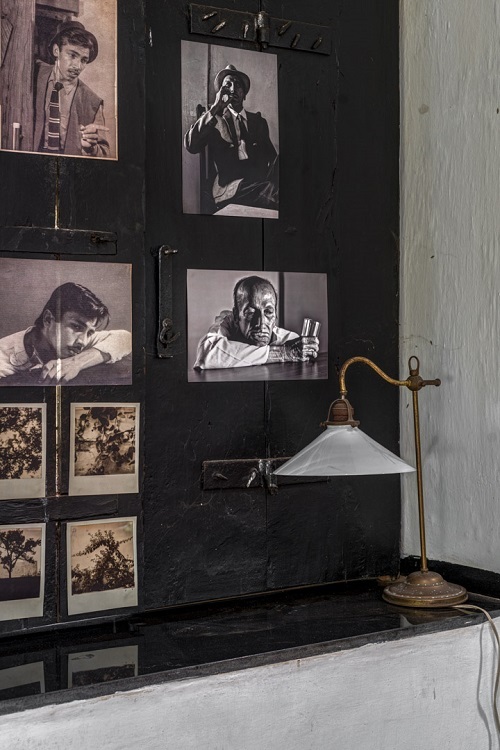 The home of Alice and Shrinivas hosts an exhibition that is an ode to the vanishing era of the family album. 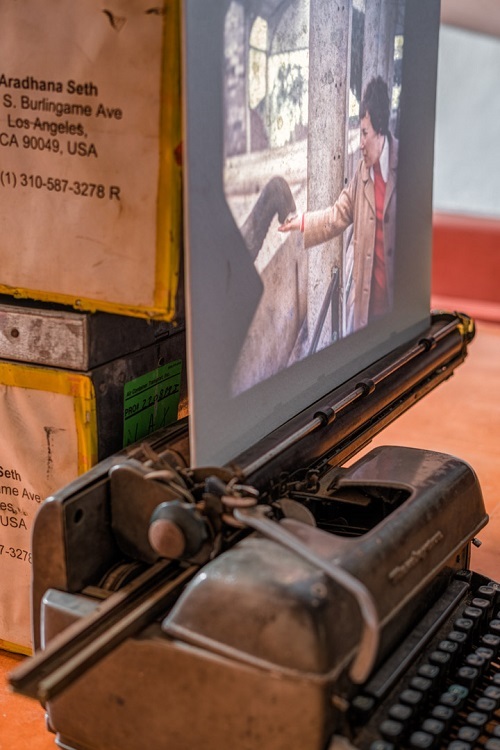 In an age when the family album has been replaced by the digital, three artists provide a thought-provoking meditation on the nature of obsolescence and memory: weaving visual narratives that attest to the once-universal appeal of documenting and displaying the mundane; works that repurpose and reinterpret their own repositories of family history and memory. 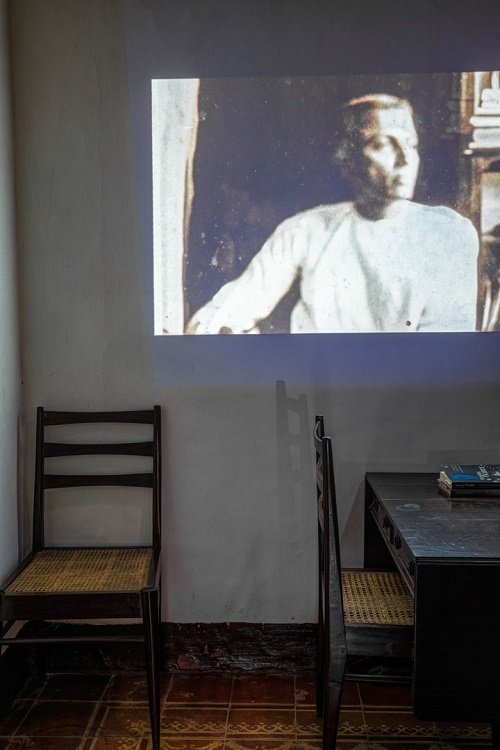 Sukanya Ghosh works within the sanctuary of family history that family albums most often present, in which the photographs are “reshaped” through the use of memorabilia, popular imagery and moving images. The resultant works employ memory and history to create imagined narratives in mythopoetic spaces. Cecilia Verilli and Federico Carpani’s work “1995 1996 1997 1998 1999 2000 2001 2002” is not really an exhibit. Rather, it is a card game masquerading as one. 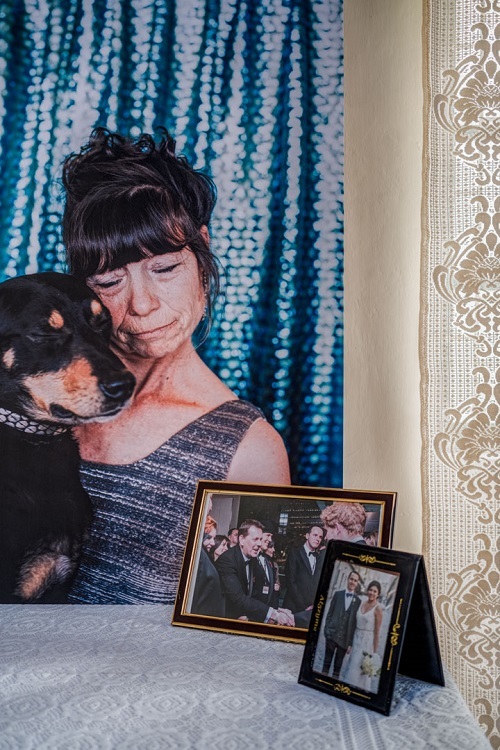 The authors have used their personal family photographs, and cropped them in alluring, enigmatic and unusual ways to create a match pair memory game. The idea is straightforward with 140 cards in total, comprising 70 pairs, which could be played face down turning one card up at a time and collecting pairs. 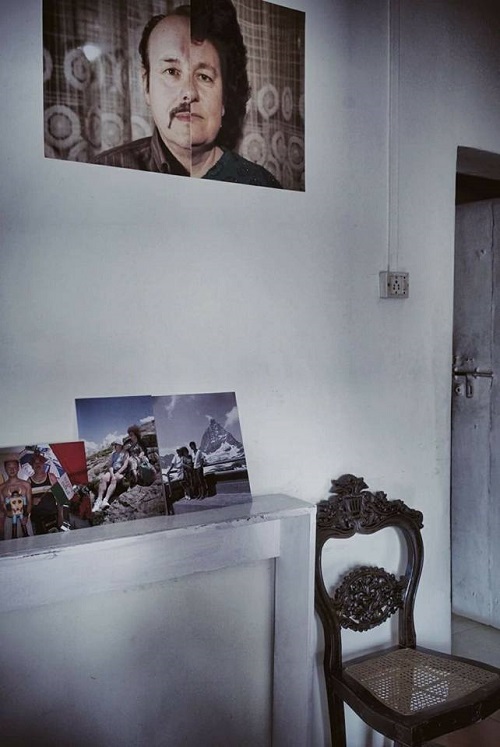 Kannagi Khanna’s photographs never tire of stories as told to her by her grandfather. 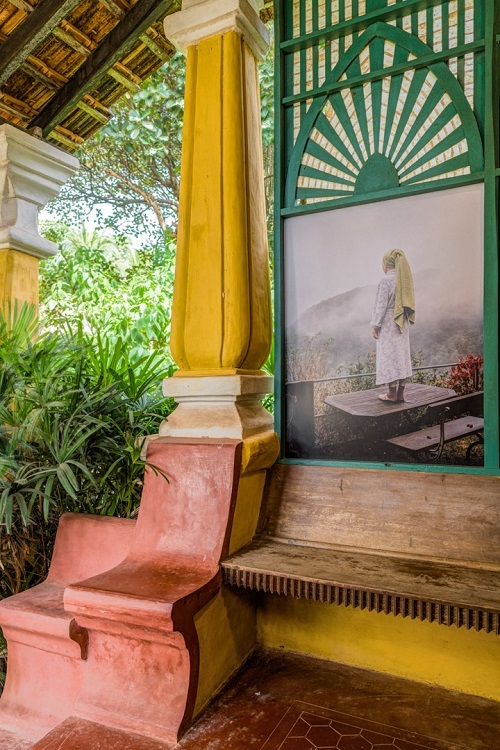 Intertwining contemporary images with family pictures, she plots memories and dreams in small town India. 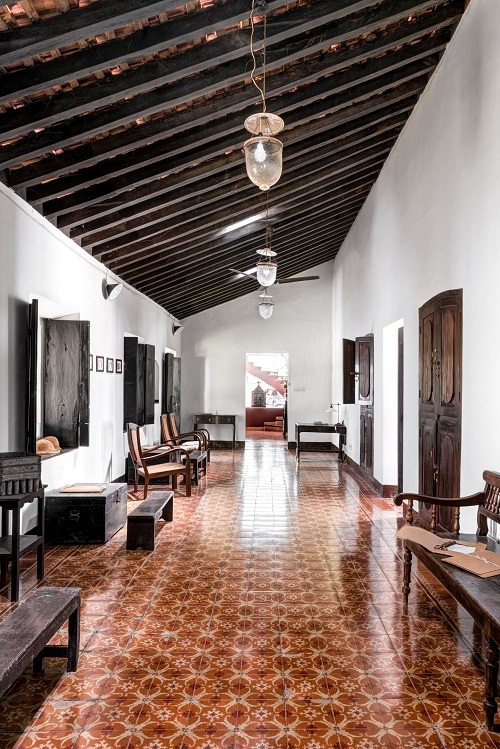 Built in 1835, Quinta Serena houses unique objects, including a double-seater palanquin, woods of African provenance, old gin-bottles and family portraits of the de Souzas. 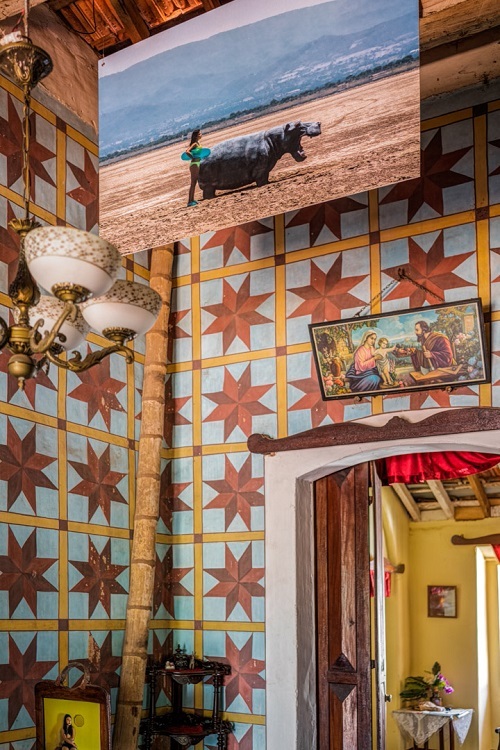 The work by Mexican photographer Claudia López Ortega welcomes the visitor in the frescoed hall. “El Paraíso” is an impoverished beach resort regularly affected by seasonal storms that destroy the local dreams of tourism development. It is against this background that the photographer observes her daughter’s growth – she compares her freckles to constellations that undergo rearrangement year after year – as well as the playful exchange of roles between the daughter and the photographer-mother. 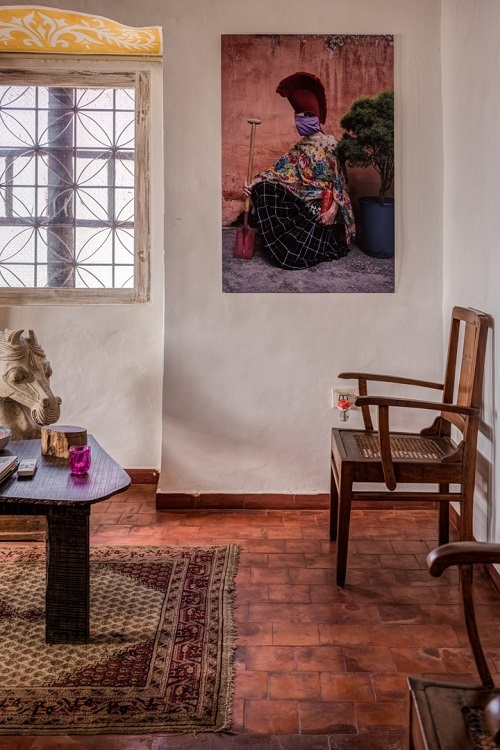 In the sumptuous Sala, you will find Roberto Tondopo’s “The Little Nougat House”, where he captures scenes of rare intimacy. The protagonists here are his pre-adolescent niece and nephew who appear deeply engrossed in themselves and, in a new iteration of the Hansel and Gretel story, intent on devouring the house they inhabit. 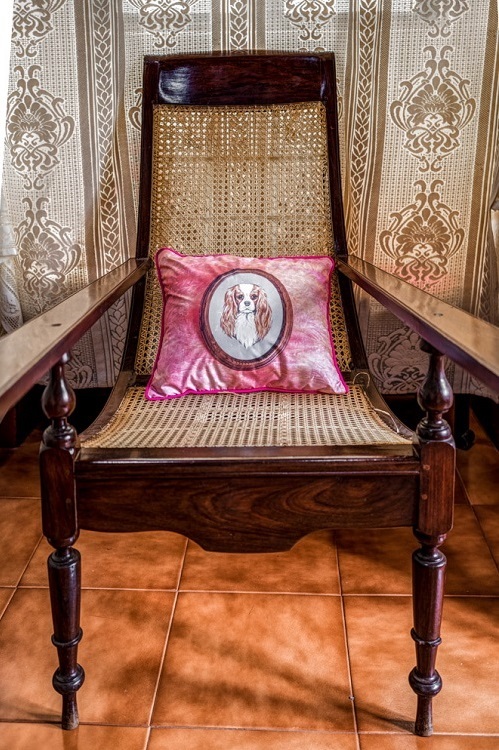 Diego Moreno’s “Guardians of Memory” is a collection of portraits of panzudos (folk monsters) in domestic settings. This follows a Catholic tradition marked by a pre-Hispanic influence, an event that takes place every year during the La Merced celebration in the Mexican province of Chiapas. Dressed as unpleasant figures, the devotees hope to purge their sins according to a peculiar motto: the uglier you appear, the purer you will become. An altogether different aesthetic ideal is explored by Elisa Gonzáles Miralles in “Wannabe”. 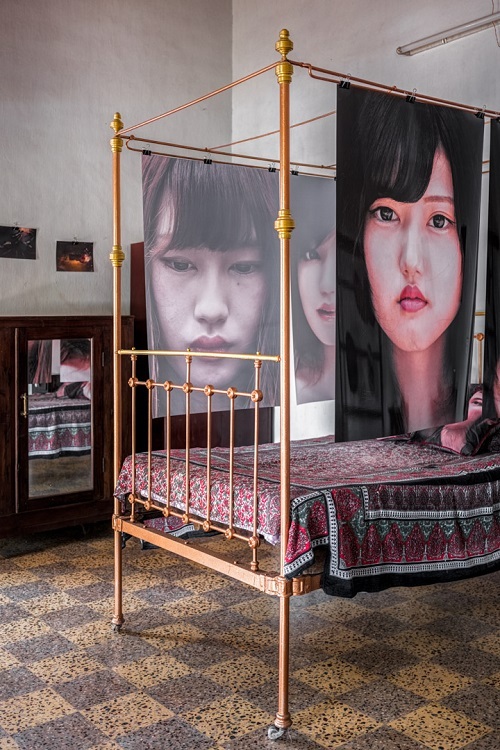 Hung from a wrought iron poster bed in the guest room are close-up shots of Japanese Baby dolls – latex human size dolls ordered from a catalogue – alongside portraits of Japanese women who imitate that aesthetic The women dress, make up and even undergo plastic surgery to that end. As the curator Jesús Micó points out, “this is a strange tale of the realistic dolls and the Japanese teenagers who both imitate one another”, perhaps telling the tale of the subjugation of women elsewhere. 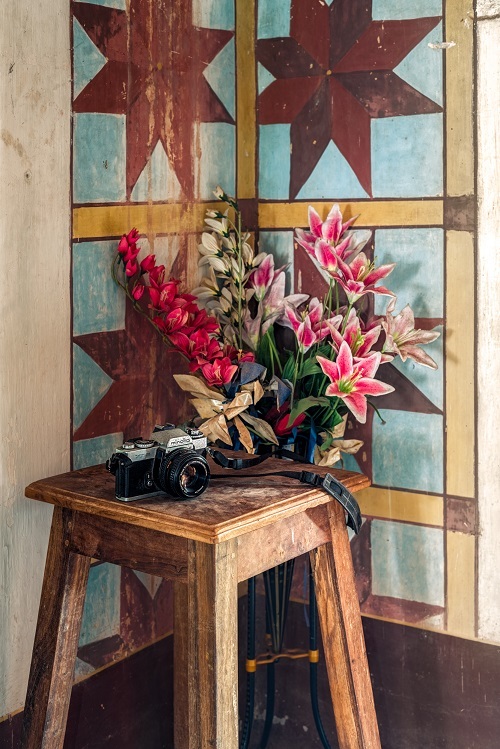 For his project This World: Mine and Yours (2007), Alexandre Sequeira invited two adolescents living in the suburbs of the Amazonian city of Pará to photograph their settings with a hand-made camera. He then superimposed their images. 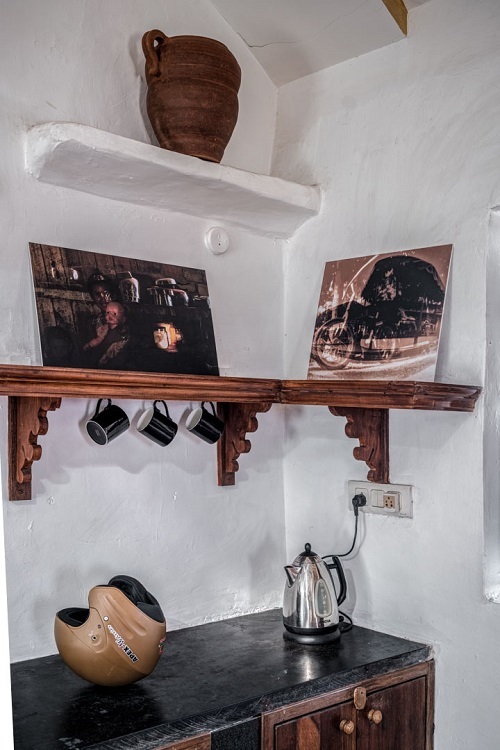 The remarkable results of this dialogue, subjected to a double mediation -one proposed by the artist and the second made possible by the photographic medium- often includes the adolescents’ domestic surroundings, which we have chosen to display in the kitchen. 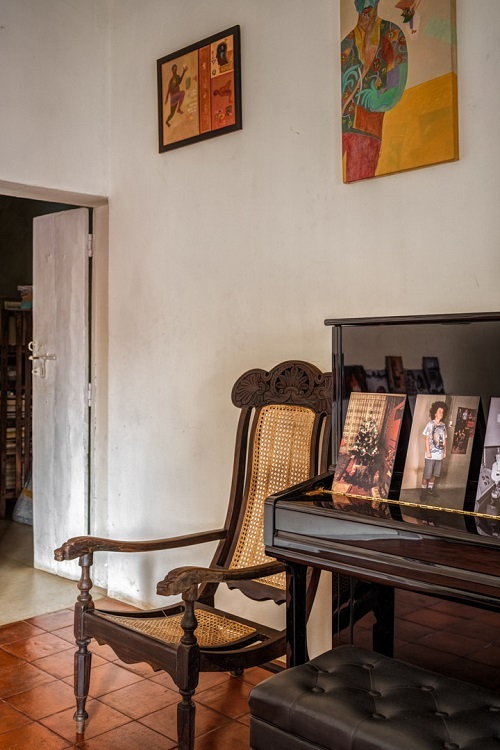 In Transparencies of Home, we observe scenes from the intimate family life of the Brazilian photographer Ilana Bar. This is a universe marked by affection and by Down’s Syndrome, which affects three of the family members. In the words of the curator Eder Chiodetto, the work stands out for its ‘subtle approach, its light and the delicacy of the frames. It is a work that overflows with love’. Look in the cupboard where many of the images with mirrors -a subtext that also runs through the series- have been hidden. 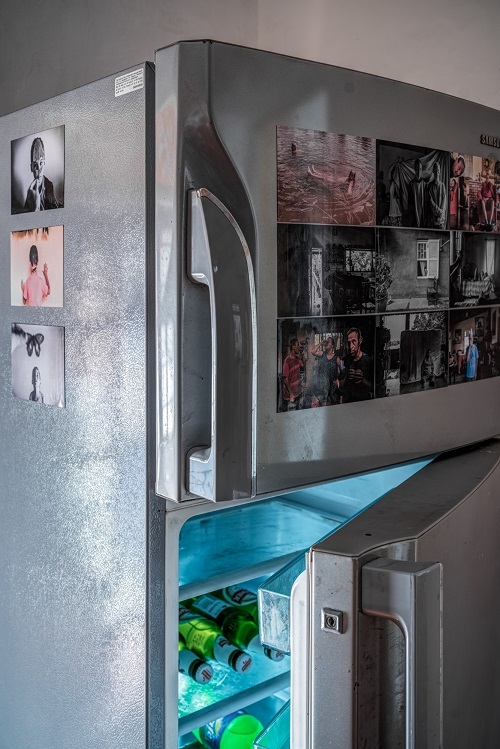 The playful self-portraits that Nino Cais presents in The Travellers are shot in his mother’s home, inventively using her objects as unexpected props, from everyday items to souvenirs collected -we imagine- during her numerous trips. 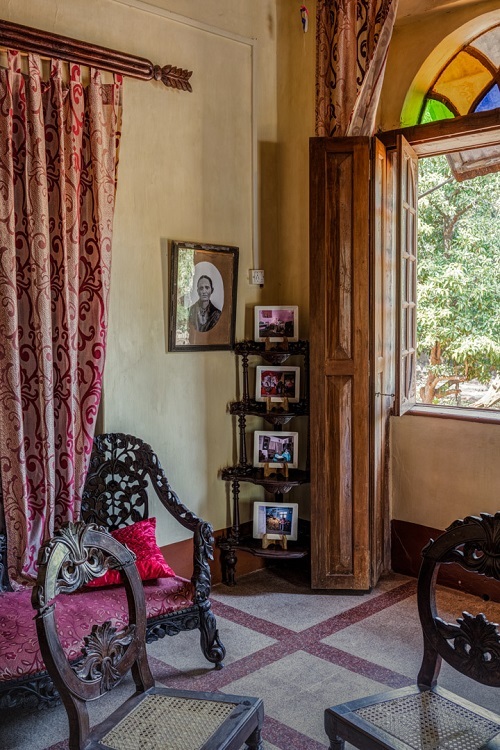 Two stone canons preside over the entrance to the home of set-designer and artist Aradhana Seth. 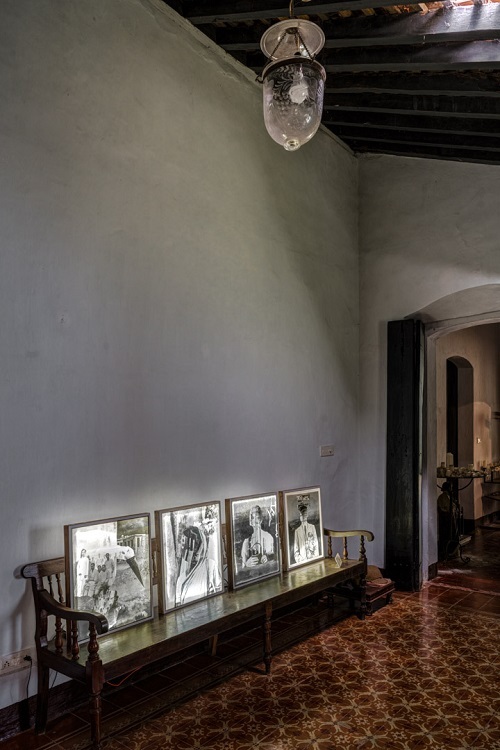 We have chosen to use the mother-of-pearl shell windows in the entrance porch to frame “Villa Argentina”, which is the name of the house that Aruna Canevascini shares with her Iranian-born artist mother in Switzerland. 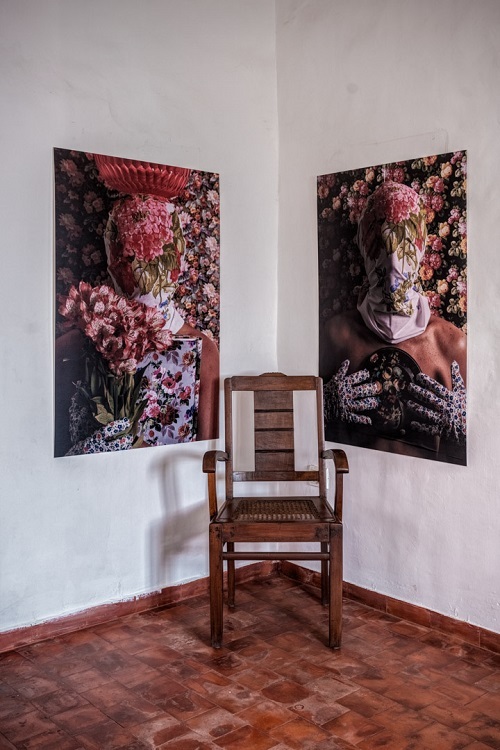 This is a collaborative project where Canevascini recreates her mother’s poetic universe filtering it through her own, using her as a model sometimes and at other times arranging domestic objets trouvés for the camera. 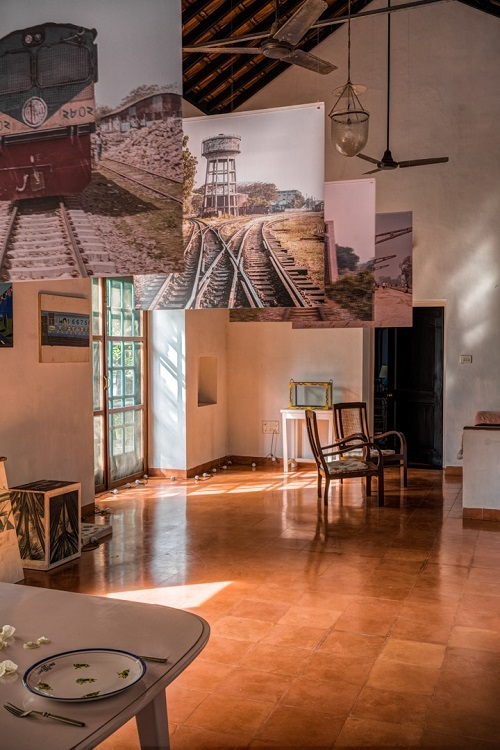 The living room – with its cathedral ceiling and filled with memorabilia for the film The Darjeeling Ltd– is the perfect setting for Rasel Chowdhury’s exploration of railway aesthetics, this time in Bangladesh. As a child, the only way to reach Rasel´s hometown was by train, a means of transportation he later substituted with the bus. “Railway Longings” narrates the rediscovery of a forgotten route and childhood memories, as the photographer stands testament to the formation of new landscapes. Anything is possible when you offer a snake box and a sculptural spiral staircase as a bait for Kapil Das to put forward a show. Given Kapil’s background, we can be sure that it will have a certain degree of wickedness. The studio contains a work-in-progress film archive, made up of “residues” of Seth’s film design work from floor plans, moodboards to props used on the shoot making transparent the process of designing a film from page to screen. 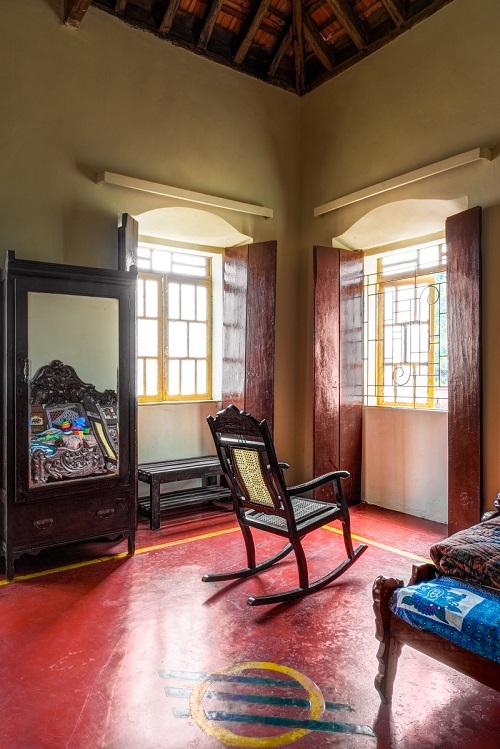 In addition there is the SET RESET exhibit, a workshop held with the Srishti Institute of Art, Design and Technology born out of an interaction with the house and what is housed in it.